One of the most common questions from visitors is how to get from Baltimore-Washington International Airport to Baltimore. Transportation options include light rail, taxis, buses, sedan shuttles, Uber, and Lyft. The trip is easy and can also inexpensive if you're willing to use public transportation. Here are your options. The light rail train departs directly from the airport and can take you to downtown Baltimore. There are stops for Camden Yards and the Convention Center in the Inner Harbor, as well as other parts of the city. A shuttle goes to Penn Station. The furthest reaches of light rail are Timonium and Hunt Valley, so look for these options as you depart (both options past through the Inner Harbor). The BWI Marshall Light Rail Station is located immediately outside the lower level of the terminal building, adjacent to Concourse E.
The Maryland Transit Administration (MTA) operates two buses from BWI. The No. 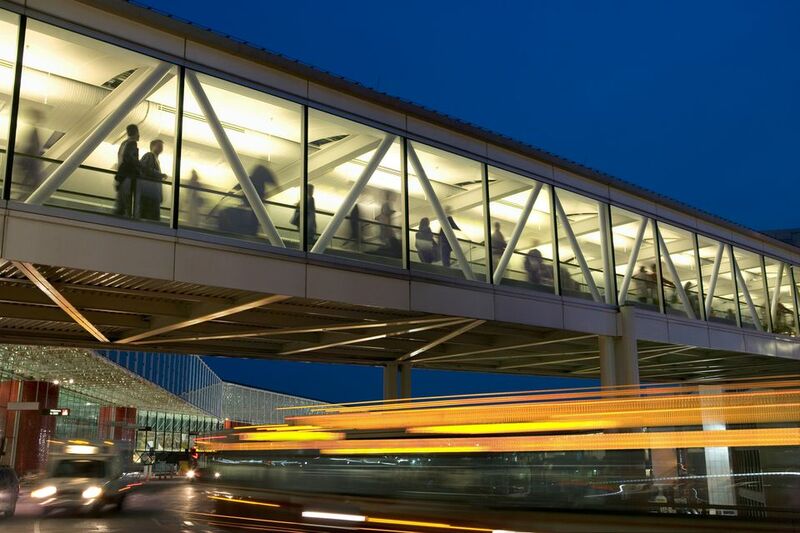 17 bus departs from BWI, connecting to Parkway Center, Arundel Mills Mall, Airport 100 Park, and the Patapsco Light Rail Station. On weekdays during peak hours, the No. 99 bus departs BWI and connects to University of Maryland Baltimore County and Community College Baltimore County-Catonsville. The MARC train, a commuter train that runs between Baltimore and Washington, has a station at the BWI Marshall Rail Station. Free shuttles go from the airport to the station 24 hours a day every day of the year. The MARC train takes passengers to Baltimore's Penn Station. Amtrak service is available at both the BWI Marshall Rail Station and at Penn Station. A taxi stand is located outside the lower level of the BWI terminal near the baggage claim. Taxis from BWI are prohibited from charging flat rates, so prices vary depending on your destination. You can take Uber from BWI. Book in the normal way and meet your driver on the arrivals level. Lyft is also available; open the app to find your pickup zone. Many hotels offer courtesy shuttles to and from BWI. Check with your hotel, and you might end up saving a fair bit of time and money. Shuttles pick passengers up in designated areas at the airport terminal. Several shuttle companies also operate out of the airport. These van services can take you to your hotel, your home, or other locations. Counters are located in the lower level of the airport, but you can also book in advance with Supreme Airport Shuttle or Bayrunner Shuttle. If you need wheels while you're in town, you're in luck: All the national car rental companies operate out of the airport. So whether you prefer Avis, Alamo, Budget, Dollar, Enterprise, Hertz, National, or Thrifty, you will find it at BWI. Book a car online before you go or stop by a kiosk when you touch down. When Should You Call 311 in Baltimore?